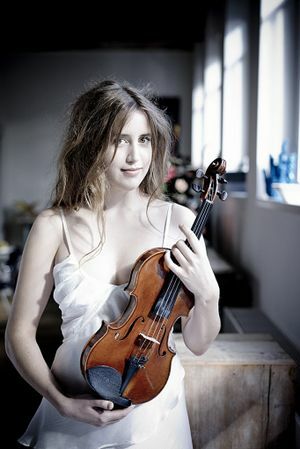 Oslo-born violinist Vilde Frang gave an expert performance of Britten’s thorny Violin Concerto No. 1. Czech conductor Jakob Hrusa and Oslo-born violinist Vilde Frang made a dazzling pair in a Seattle Symphony Orchestra program of Dvorak, Britten, and Strauss. The scene-stealer at Seattle Symphony Orchestra on Saturday night, however, was the young Norwegian violinist Vilde Frang and her dazzling, impassioned reading of the thorny Britten Violin Concerto No. 1. Looking as if she had just stepped out of a Pre-Raphaelite painting, the soloist gave an utterly committed, finely nuanced performance that made it clear she owns this difficult, often fierce concerto. Britten composed it while still in his 20s, and it is like no other: How often do you hear a violin concerto in which the initial motif is introduced by timpani, the trombones announce a new subject and the soloist is backed by a full brass section? You’d think the pure, sweet voice of Frang’s violin would have no chance, but guest conductor Jakub Hrusa made certain the soloist was beautifully supported and never overshadowed. Partnering the quicksilver violinist must have been a challenging task as she made every phrase distinctively her own, with long, expertly-shaped lines that sank down to a whisper and roared to life again in spiky utterances. Frang’s fingerwork and bowing were impressive throughout, most of all in the tricky extended harmonics in which the soloist teeters at the edge of control. On a technical level alone, her performance was jaw-dropping; what made it exceptional was the thought and the artistry that had obviously gone into shaping the nuances of every note. Hrusa was a brilliant concerto partner, and the other two works on the program made it clear that this Czech-born maestro knows how to get fine performances from the orchestra. The opener, Dvorak’s “A Hero’s Song,” was replete with the lovely melodies and folkloric elements beloved by Hrusa’s countryman. The performance was precisely cued and vividly realized. Hrusa drew particularly expressive solo work from the clarinets and the brass. At the end of the performance, the conductor responded to a warm ovation by raising Dvorak’s score aloft, as if to indicate that this is where the real credit lies. The evening’s grand finale was Strauss’ “Zarathustra,” with the dramatic opening “Sunrise” motif that is among the world’s most recognizable themes. The three-note rising theme appears throughout the score, differently each time, as if seen through a twisting kaleidoscope. Hrusa went for subtlety as well as majesty, letting the score wax and wane throughout its nine connected and colorful episodes, expertly balancing the various instrumental choirs, underlain by the rumbly majesty of the hall’s Watjen Concert Organ (played by Joseph Adam). Hrusa’s clear beat and impassioned energy seemed to inspire the players, from contrabassoonist Mike Gamburg to acting concertmaster Emma McGrath. This is a piece in which virtually every section in the orchestra has its moment in the spotlight, and most of them rallied for fine performances as Hrusa drew them out in turn before the anticlimactic, question-mark finale. Melinda Bargreen also reviews concerts for 98.1 Classical KING FM and the American Record Guide. She can be reached at mbargreen@gmail.com.